Actress Lori Loughlin was taken into custody by the FBI Wednesday in Los Angeles after she, fellow movie star Felicity Huffman and 48 others were charged in a $25 million college admissions scam that ABC News said has prompted repercussions from Hollywood to the boardrooms of major corporations. A former cast member on the ABC sitcom “Full House,” Loughlin and Oscar-nominated actress Huffman, are among 33 parents charged with conspiracy to commit mail and wire fraud in the nationwide scam to get their children into elite colleges, including Yale, Stanford, Georgetown and the University of Southern California. “Kelley Williams-Bolar and Tanya McDowell enrolled their children into Public School Districts in which they did not reside,” one Twitter user with the handle @dlnodots wrote. “They were both jailed for these crimes. Should Felicity Huffman and Lori Loughlin be held to that same standard?” the user wrote. Others on social media concurred with @dlnodots. In 2011, Williams-Bolar, a black woman, was sentenced to 10 days in county jail, three years of probation and $30,000 in restitution for lying about her residency to get her daughters into a better school district in Ohio. For McDowell, the punishment was worse. “[McDowell] got 12 years for sending her six-year-old son to Norwalk, Connecticut’s Brookside Elementary School while she ‘lived’ in Bridgeport, even though she was homeless,” said Bishop Talbert Swan, an activist and pastor. 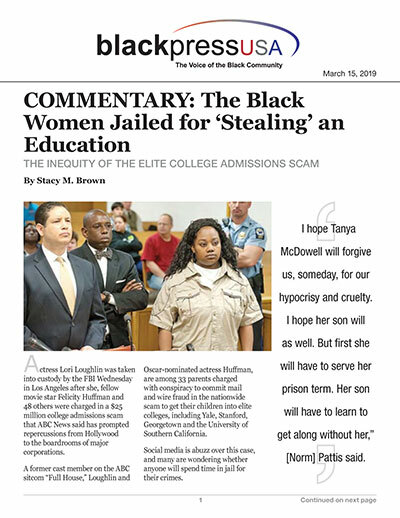 “She was convicted of 1st degree larceny for ‘stealing’ an education,” Swan said. When McDowell was sentenced in 2012, she vowed to continue to fight for a better education and life for her young son. Simply put, she wanted a better life for her son, so she enrolled him in the Norwalk public schools despite having no real ties to the city. “When the city found out that it was spending its money educating her boy, it demanded that Ms. McDowell be charged with a crime,” Pattis said. “Norwalk prosecutors, known statewide for an unreasoning mean-streak, obliged. She was charged with first-degree larceny,” he said. Pattis added that McDowell needed help, not a prison bed. “But Norwalk prosecutors piled on. They would not negotiate a resolution of her separate and distinct cases. No, not these ministers of justice,” Pattis said. “A woman is sent to prison for wanting a better life for her children. She is doing time for using an illegal drug. Had she drunk herself to death it would be no crime. Or had she smoked four packs of cigarettes a day to sooth her jangled nerves, no one would care. But the wrong people are profiting from the drugs McDowell used,” he said. “We imprison the sick and call it justice. Now we imprison the homeless looking for something better for their kids.